Bird song and call apps often get a bad press as a result of misuse by a minority of birders and photographers to lure birds closer. If, like me, you struggle to commit calls and songs to memory and have the added impediment of being tone deaf, they are, however, a godsend when it comes to helping with identification in the field. The Aves Vox app is based on the simple but clever idea of tapping in to the rich resources of the crowd-sourced Xeno-Canto website that is perhaps an unrivalled online resource for bird song and calls. The app provides access to more than 30,000 bird vocalisations in a database that is continually growing in both size and quality. 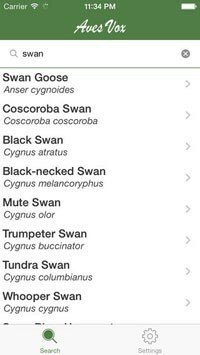 On opening the app you get a simple 'search species' box that allows the user to search based on either English or scientific names. Searches start based on three characters but are refined as you type more of the name. As many of the birds have a large number of recordings, once the individual species has been loaded you can filter based on the specific type of vocalisation you require: song, flight call, alarm call and so on. There are no images and no flashy add-ons or complicated menu structures — the beauty of Aves Vox is that it is simple, functional and works perfectly. 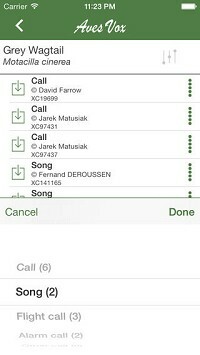 Aves Vox is almost certainly the most comprehensive bird call app on the market and it's free. A pro version is available for £2.99; this allows users to create their own checklists of species, a useful tool for regular travellers. If you're an active birder with an iPhone, Aves Vox is simply a must-have app.